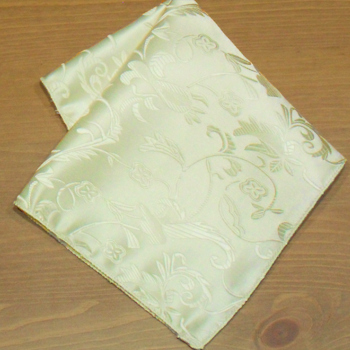 Luxury ivory pocket square handkerchief jacquard weave fabric that can be monogrammed with embroidered letters of your choice. Luxury ivory pocket square handkerchief jacquard weave fabric that can be monogrammed with embroidered letters of your choice. We can add personalisation to this pocket square with embroidered initials, a numerical date OR a single name towards one bottom corner of the kerchief.